Slip-resistant ribbed treads 89mm deep. Large chequered platform for extra grip, W x D: 400 x 530mm. Handrails fitted to both sides for added safety. N.B. Taller steps up to 20 tread height available to special order. 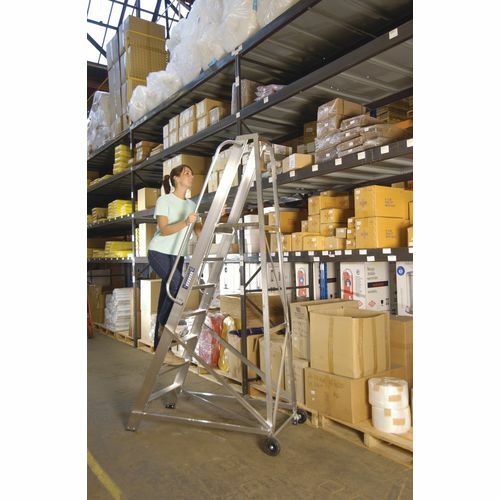 When working in a warehouse you may spend a large amount of time accessing products that are in hard to reach high up areas, a reliable set of steps will be required to keep employees safe. 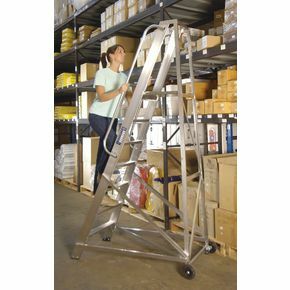 Our extra heavy duty aluminium warehouse steps are a great addition to help employees easily access shelves to place or distribute items. The slip-resistant ribbed treads are 89mm deep and provide underfoot grip. Another safety feature is the handrails which are fitted to both sides of the steps for added security. The large chequered platform is 530mm deep x 400mm wide, making it easy for the user to perform tasks at height. The serrated rubber feet at the bottom of the steps keep them firmly in place while they are in use. They are also fitted with wheels to the rear for easy movement and manoeuvrability. There are eight platform heights available; 933mm, 1170mm, 1400mm, 1635mm, 1875mm, 2095mm, 2365mm or 2560mm. Our extra heavy duty aluminium warehouse steps are a great addition to any warehouse, helping employees work safely and efficiently at height. They come with a 12 month guarantee and FREE UK Delivery.